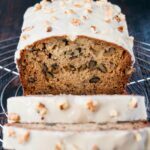 This deliciously moist banana bread is elevated with the addition of the classic flavor of maple-walnut. It’s topped with a sweet maple syrup glaze and crunchy chopped walnut pieces. I feel like 2018 has been a slow start for me. We’re already a third of the way through the month and I’m just getting back into the groove of things. I’m hoping to pick up the pace very soon, as I have big plans for this year, starting with a home office remodel and maybe even a new blog. 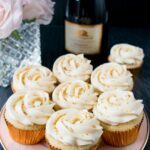 How do you guys feel about wine and dessert pairing? Anyways, to kick things off for the new year, let’s talk about this amazing maple glazed banana walnut bread. 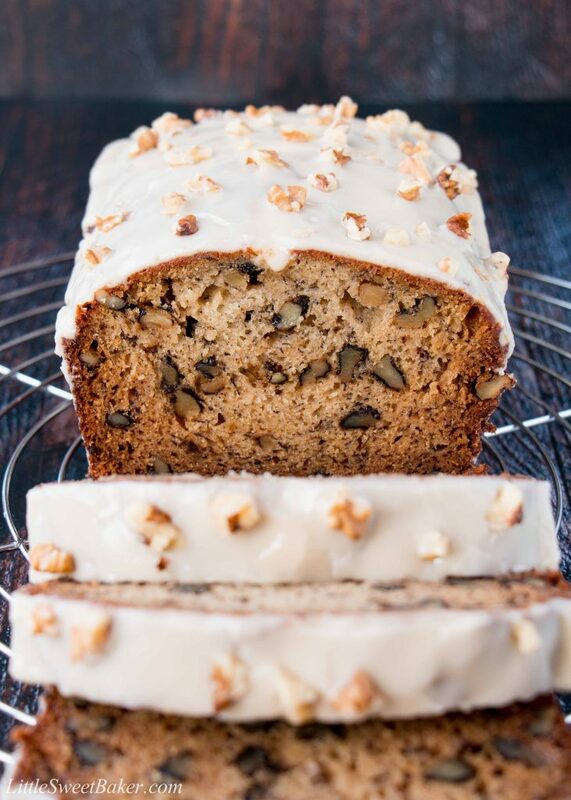 I love adding walnuts to my banana breads. It adds a nice contrast in texture to the soft and moist bread. I also love pairing the flavor of maple syrup and walnuts together. It reminds of my childhood and going out for ice cream with my mom. It was her favorite ice cream flavor. The bread and the glaze is all made by hand in this recipe. I’m finding I’m using my electric mixers less and less these days. To me, it’s just easier and quicker to make things by hand. 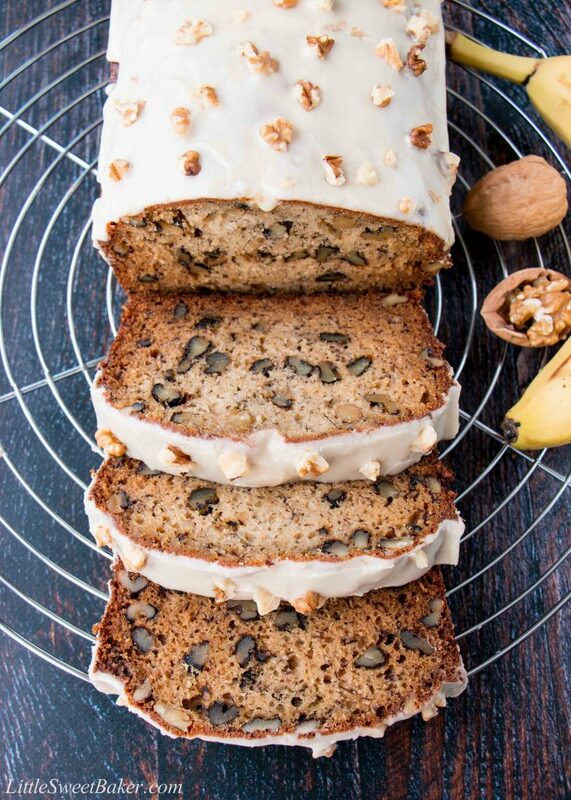 This banana walnut bread is full of crunchy walnuts and fruity banana flavor. 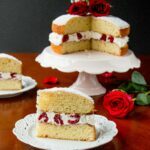 It’s topped with a thick creamy glaze that has a sweet-smokey maple flavor. 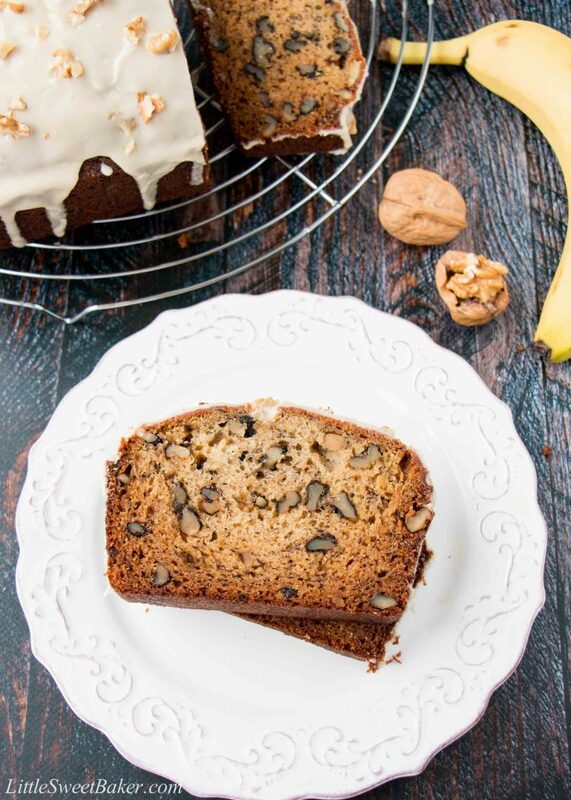 Crunchy, creamy, sweet and fruity – this banana walnut bread has it all! 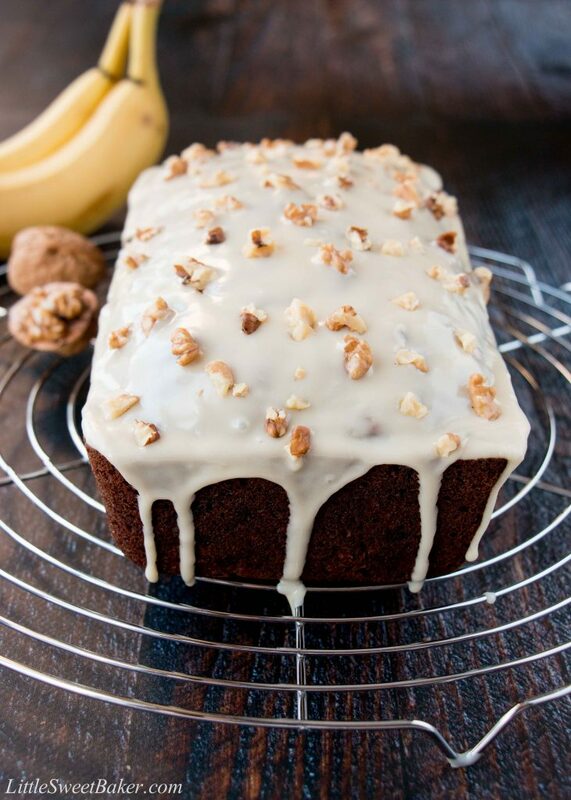 This moist and flavorful banana bread is elevated with the addition of a delicious thick maple-walnut glaze. Preheat oven to 325F and grease a 9×5″ loaf pan. In a large bowl, toss together the flour, sugar, baking soda and salt. Set aside. In a medium bowl, whisk together the mashed bananas, vegetable oil, maple syrup, eggs and vanilla. Add the wet ingredients to the dry and mix together until almost combined. Fold in the walnuts until just combined. Pour into prepared loaf pan. Bake for 1 hour 10 minutes or until a toothpick inserted into the center comes out clean. Let cool completely before glazing. To make the glaze; whisk together the powdered sugar, maple syrup and extract in a small bowl. Add just enough milk or cream to make the glaze smooth. Slowly pour over cooled bread. Sprinkle with walnut pieces. Let dry for a few minutes before slicing. So soft and the walnuts on top add an amazing taste! Thank you for your kind words. I’m so happy you like my recipes. You can replace the maple syrup with honey, and for the maple extract you can use 1/2 tsp of vanilla instead or just omit it. I hope you enjoy this banana bread, and have a great Easter weekend! Thank you Lily , have a great easter weekend too. This looks so good! Love your photos too! Thanks Kat and nice to meet you! We’re renovating as well. Starting with a brand new office for me! So excited (happy dance). Thanks for finding me a co-host. Do you want me to comment on the odd or even numbers? This is such a great combination of flavors! I’m inspired to make bake one now. I’m trying to go easy on refined sugar this year, so I’ll probably increase the amount of maple and replace that with the sugar. Thanks for sharing at FF! You’re welcome and thanks for co-hosting. You can also skip the glaze and just add the maple extract to the batter for the same flavor but less refined sugar. Enjoy and have a lovely day! 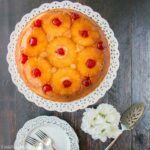 What an amazing glaze for banana bread!! I would absolutely love this! Thanks for sharing, Lily! Wine and dessert pairing? Yes please! This also might be the prettiest banana bread I’ve ever seen!